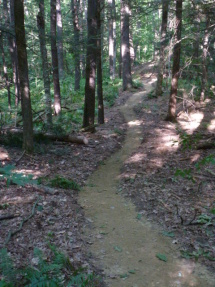 Trails offer the chance to enter a world that many of us love and need to visit. 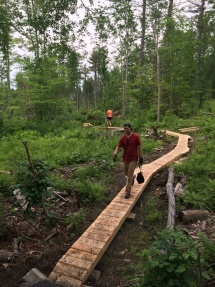 We hope that many more will learn the pleasures of following a trail to see where it takes them and what they’ll learn and find. 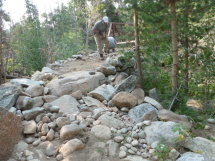 There is a never ending need to maintain trails that were built over the previous decades and new trails are still being built today. 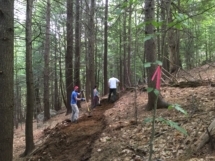 Good trails require thorough planning and design and proven construction techniques. 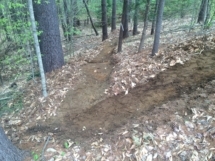 This results in trails that require less maintenance and a trail that is sustainable while ensuring a safer, more enjoyable experience for the users. 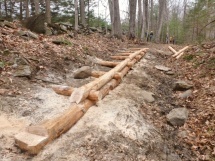 SnowHawk LLC will assist with improving and preserving your existing trails but will also design and build new trails. 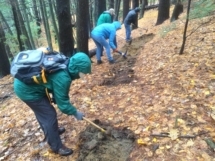 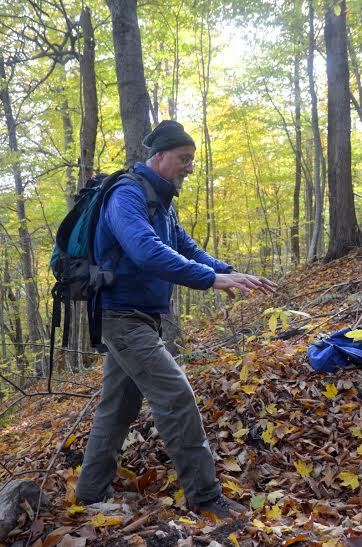 Though many projects are on trails designed for passive recreation, the work can include everything from simple foot paths to hiking, biking, and ski trails as well as work on trails or roads used for motorized access. 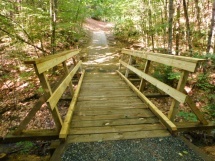 With my previous experience as a carpenter and builder, our specialty is projects that combine woodworking and trails. 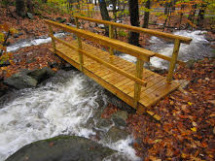 This includes bridges, boardwalks, steps, retaining walls, shelters, kiosks, signs, and more using a combination of hand and power tools. 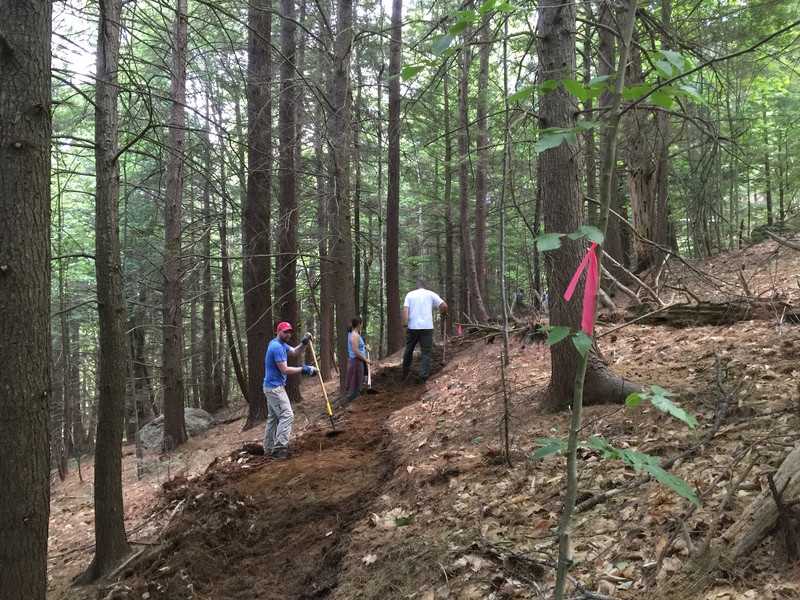 Our clients include land trusts, conservation commissions, local, state, and federal agencies, non-profits and private landowners. 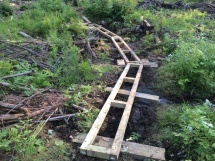 Projects can include both hand built and machine built trails. Occasionally SnowHawk will partner with contractors that have specialized equipment or skills that would benefit the outcome of a project. 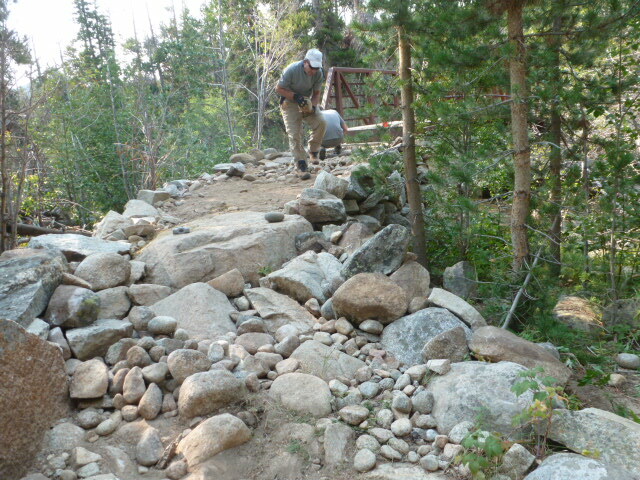 Here are a few examples of trail design and construction projects. Freshly cut new trail for fine tuning and hikers. 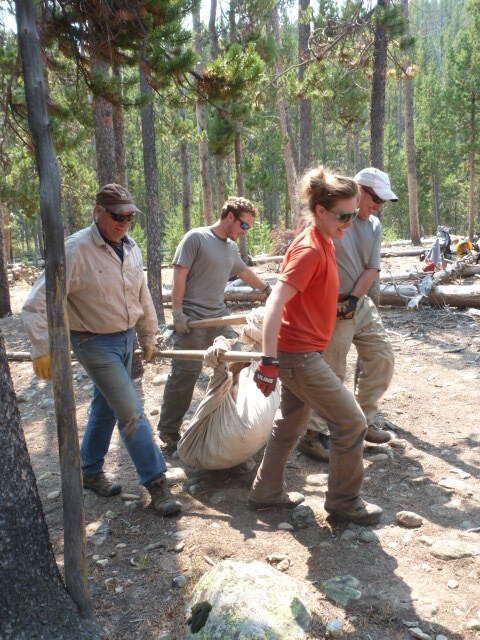 Moving a large rock with rock bars during a trail skills training with SCA. 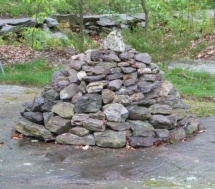 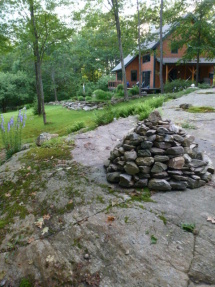 An extra large cairn used as a landscape feature. 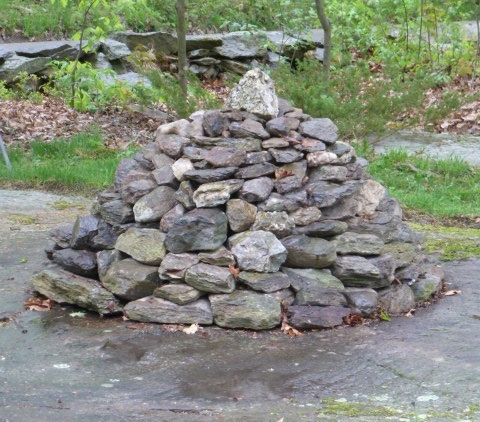 Trail cairns are typically much smaller. 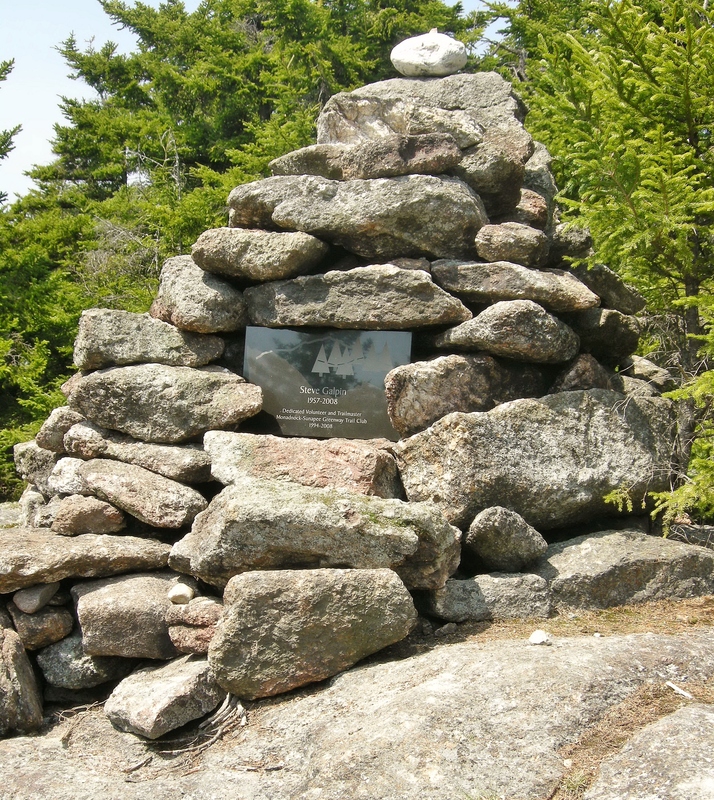 Cairn and memorial plaque built to honor a fellow trail friend. 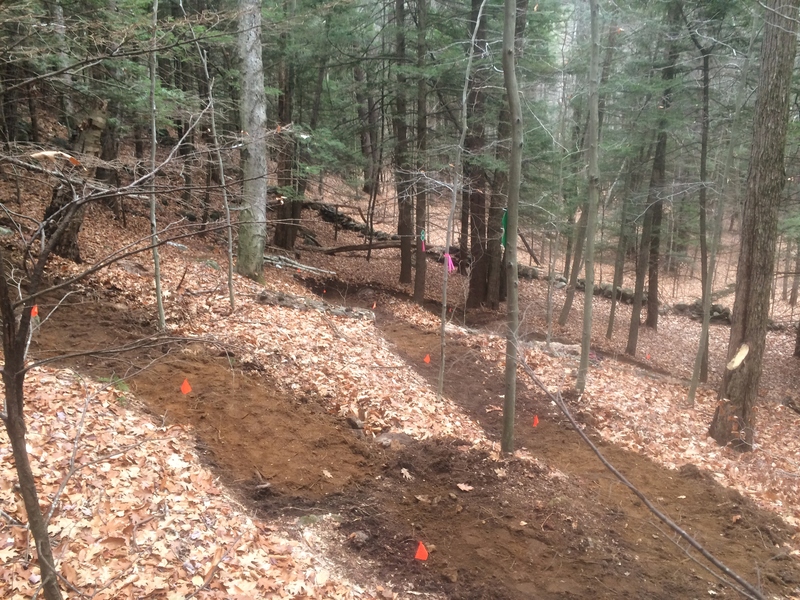 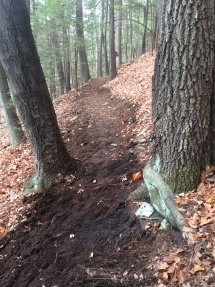 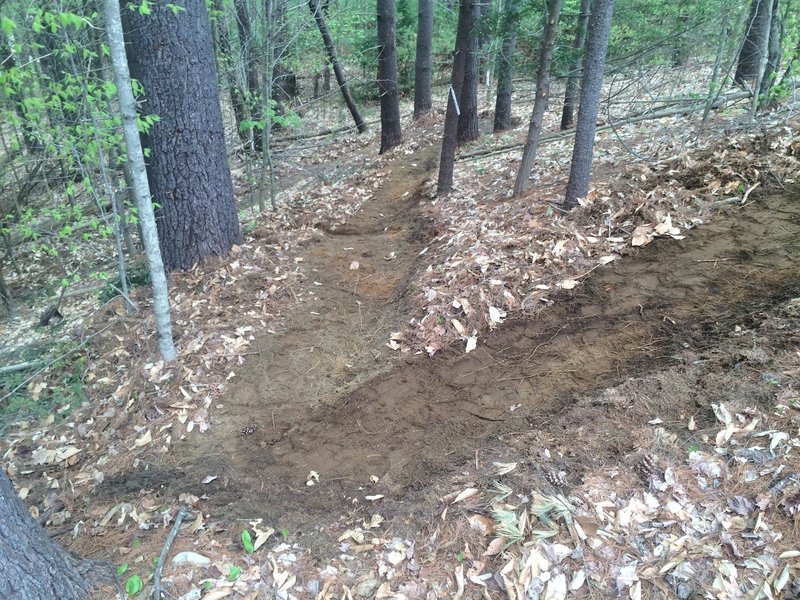 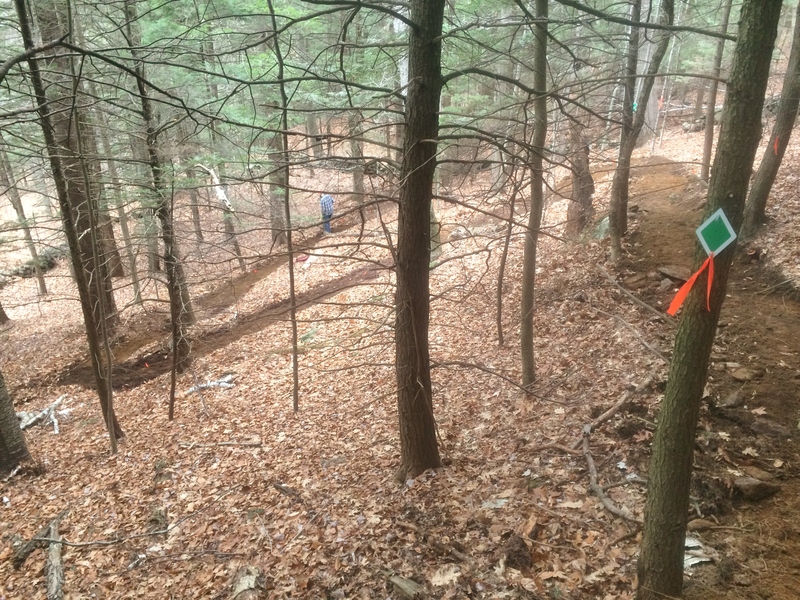 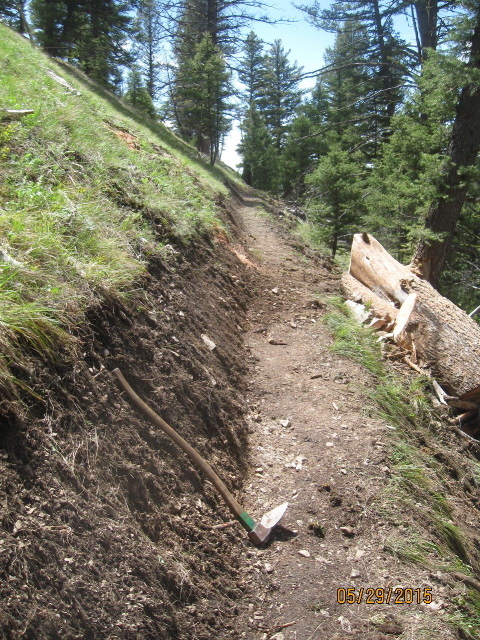 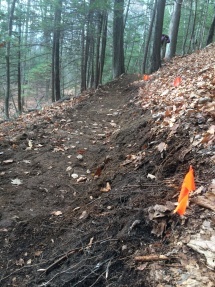 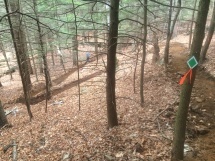 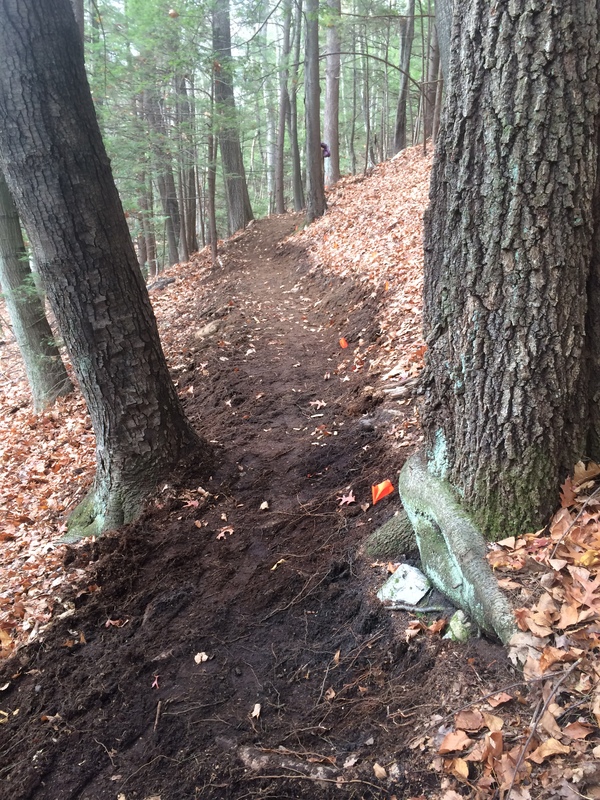 This trail reconstruction was on one of the steeper slopes that we've worked on. Moving fresh cut logs into place. 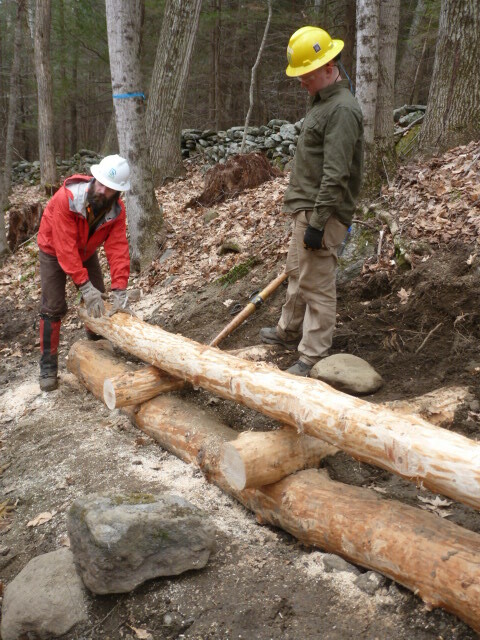 Preparing to fit another log on the step structure. 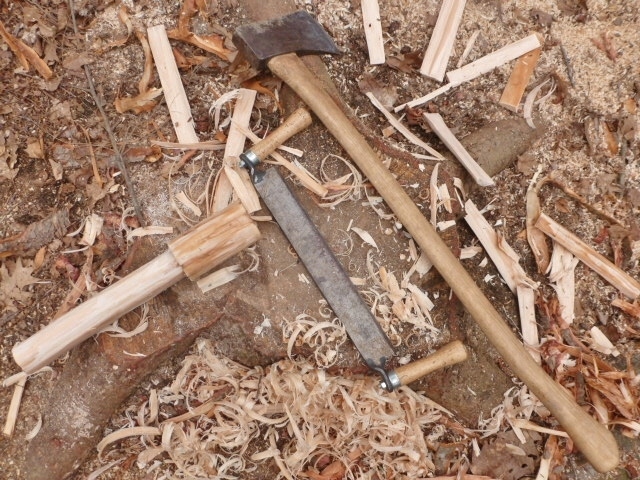 Need to replace a tool when it breaks? 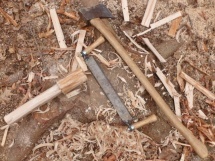 This mallet was made using an ax and draw knife. 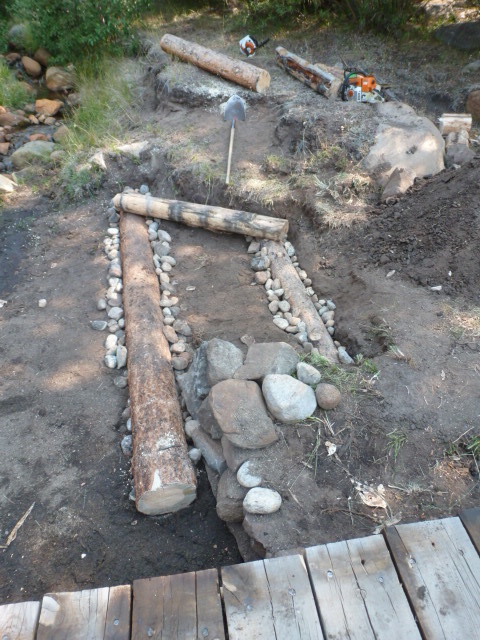 A workshop for timber construction skills built this structure that will be back filled and used as steps. 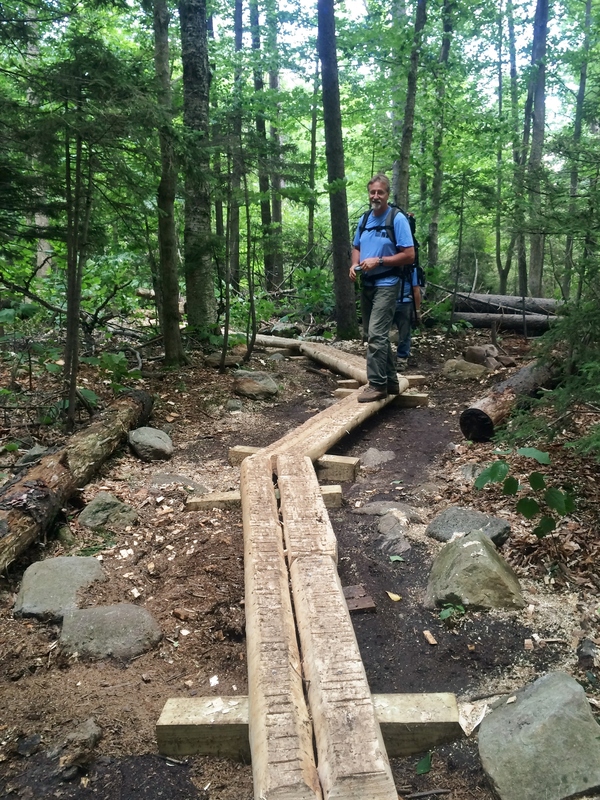 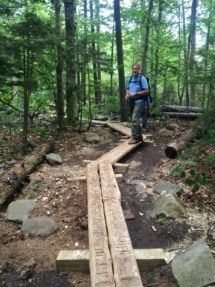 Monadnock Trails Week with SPNHF. 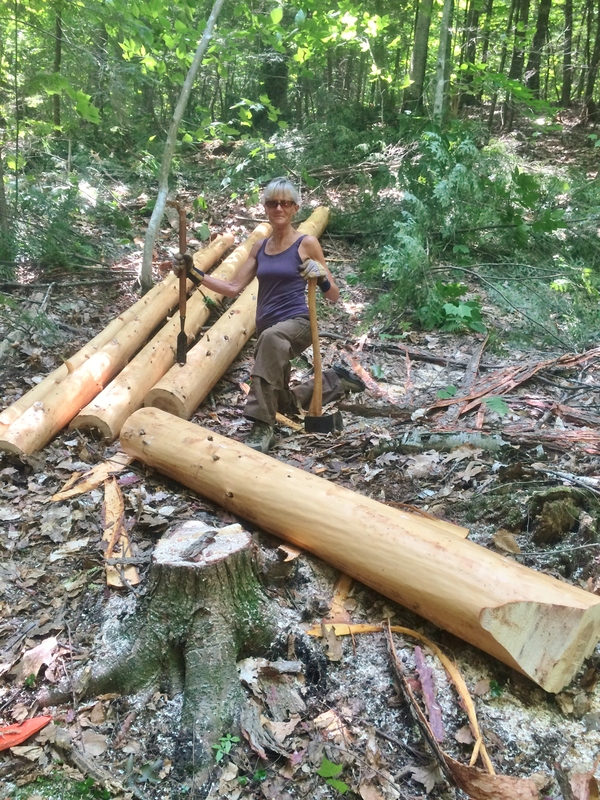 Making little ones out of big ones. 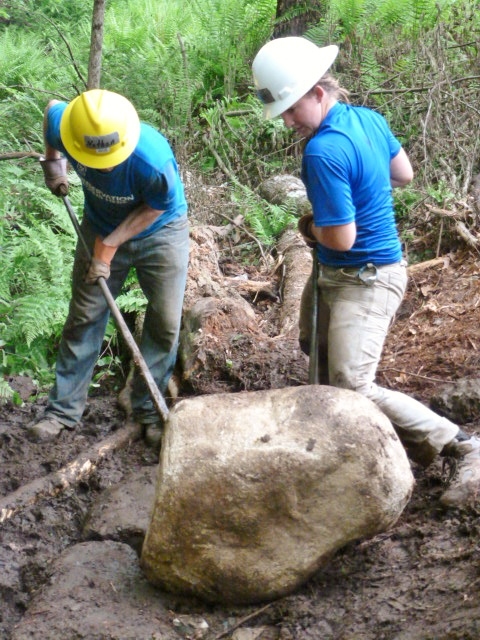 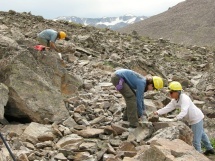 Building trail in a boulder field. 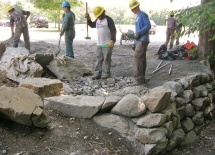 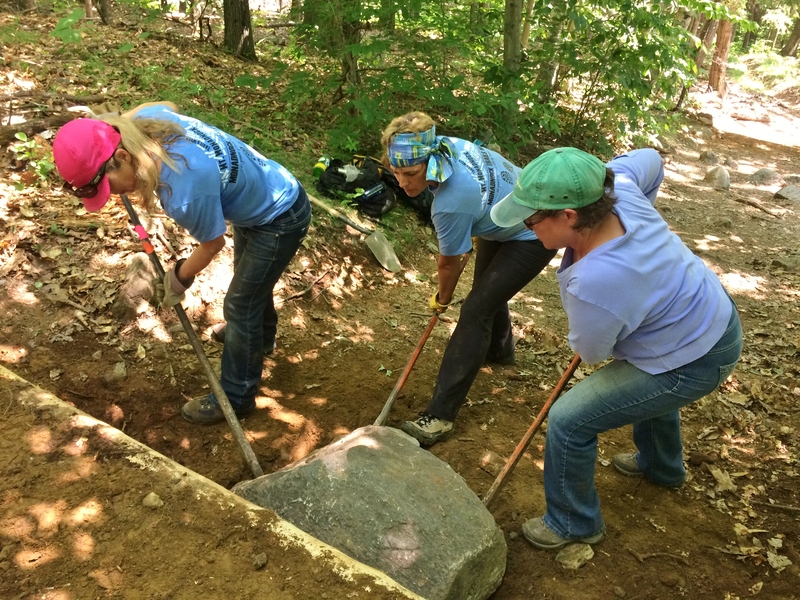 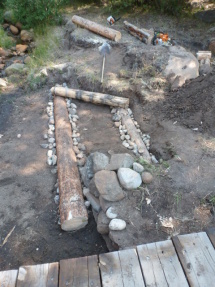 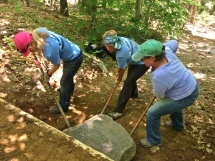 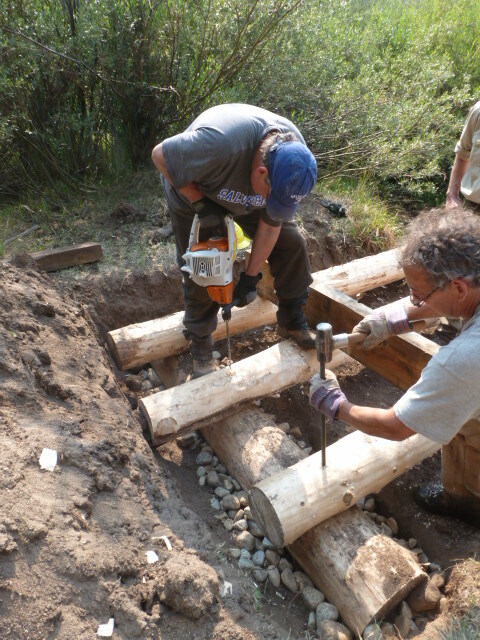 Using rock to rebuild the foundation of a ramp that leads to a bridge used by horses and hikers. Using a tarp and saplings to haul fill for a backcountry bridge ramp. 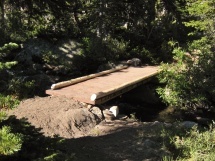 Improved ramp access to bridge on trail used by both horses and hikers. 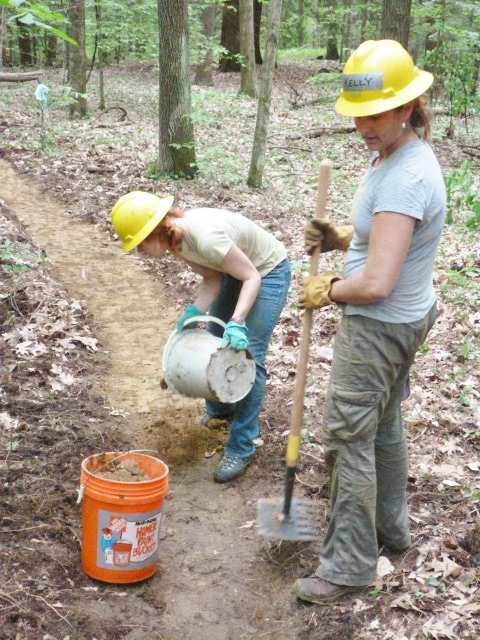 Using buckets to haul fill from a borrow pit while building new trail during a workshop. 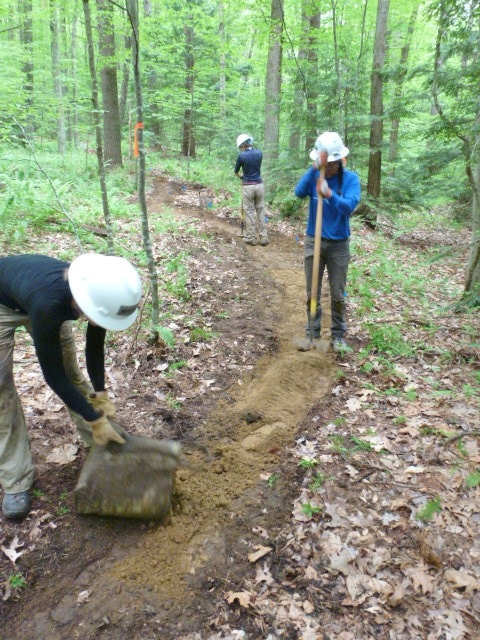 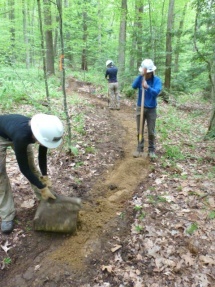 Constructing a new trail during a trail skills workshop. 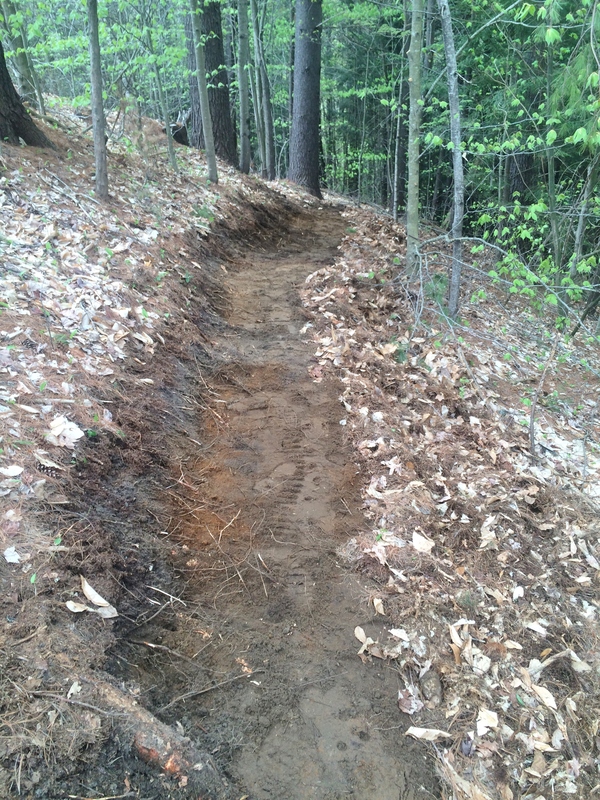 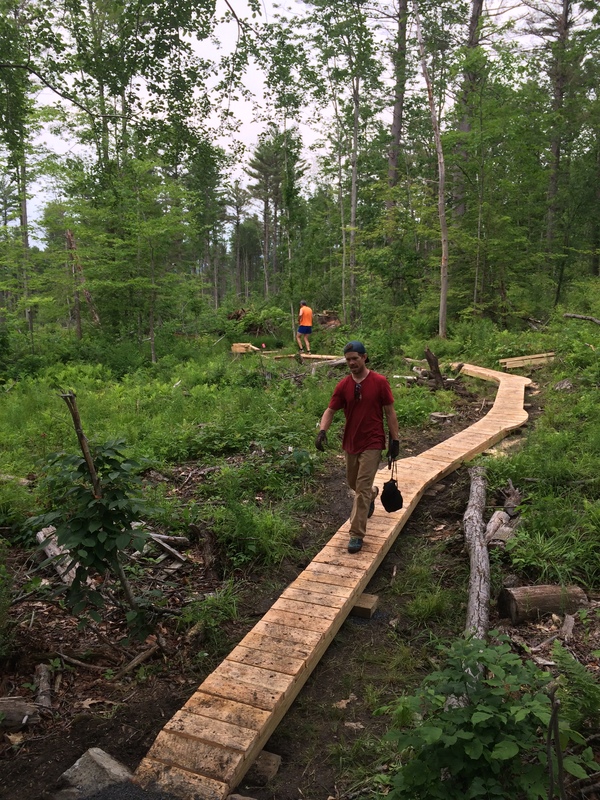 This multi-use singletrack trail was built during a trail skills workshop. 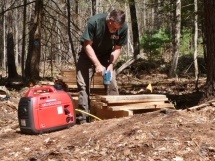 Portable generators make it possible to use power tools on remote work sites. 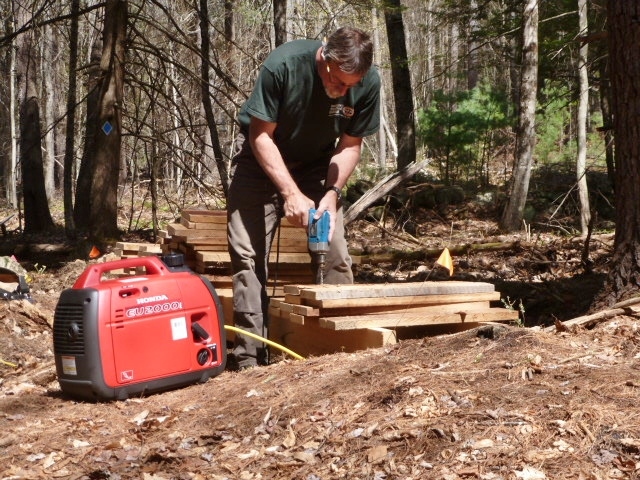 Generators make remote site work with power tools possible. 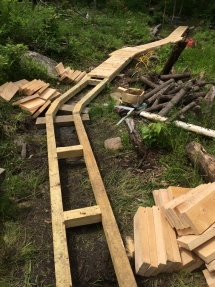 Simple plank boardwalk. Cedar and black locust sills. First boardwalk and the location of a special wedding. 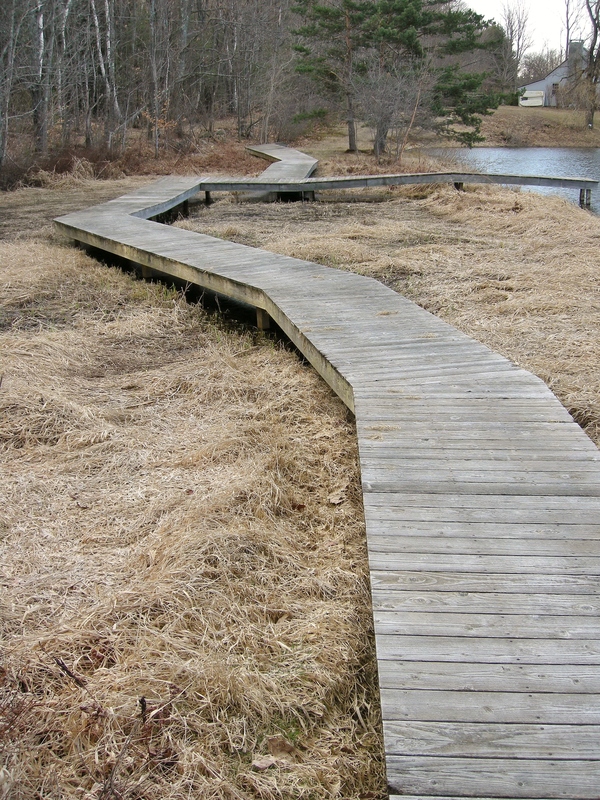 Old boardwalk still holding up twenty-five years after building it. The annual frost heaving settles in the spring. 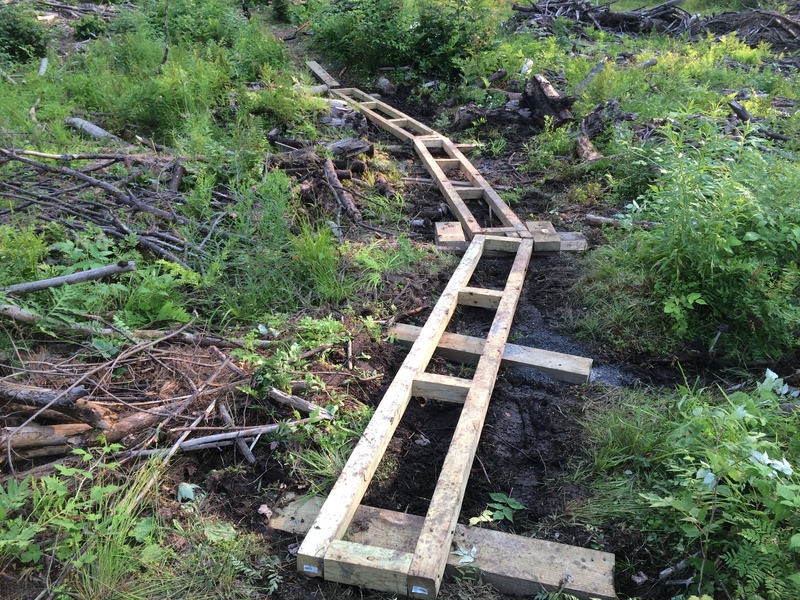 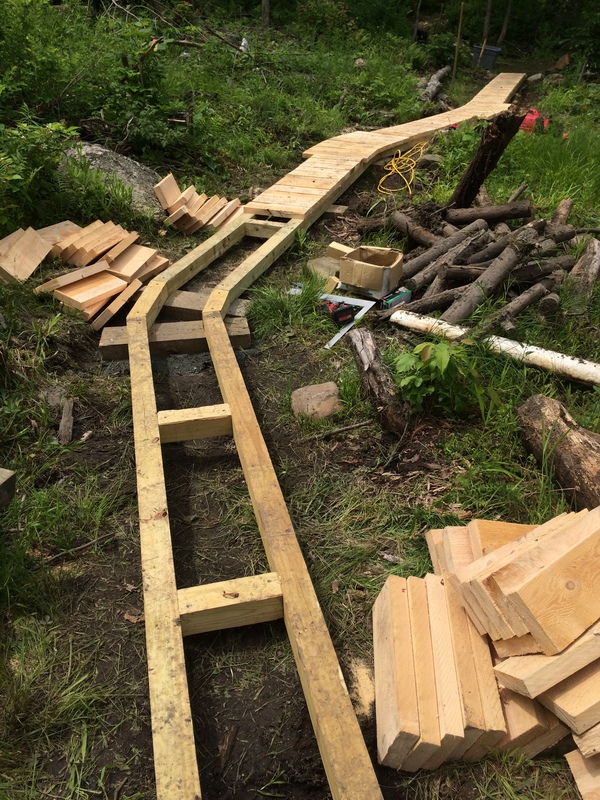 Boardwalk framing for mountain bike/hiking trail. 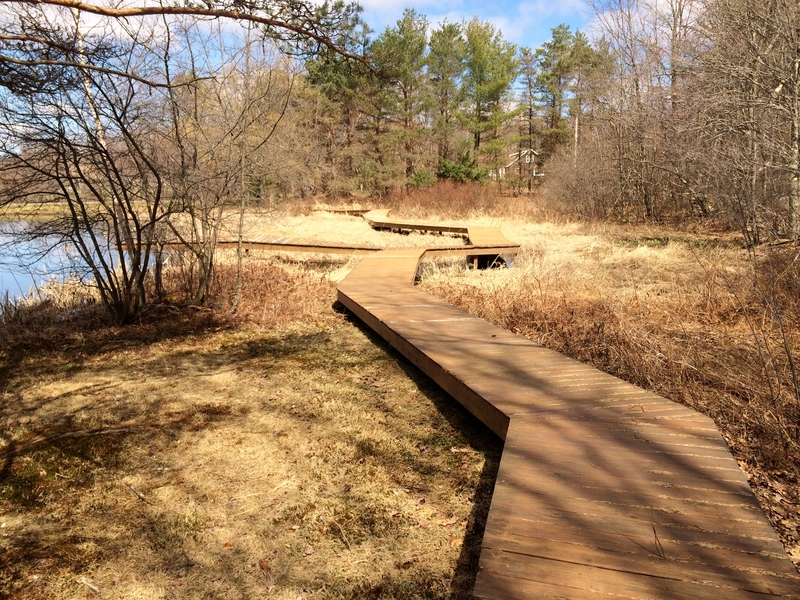 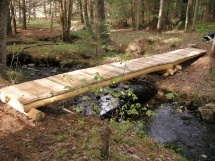 This boardwalk allows both hikers and mountain bikers to stay dry while protecting the surrounding environment. 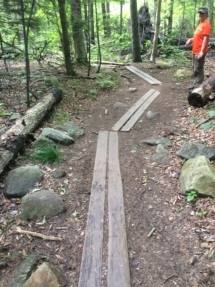 Single track boardwalk for mountain biking/hiking. 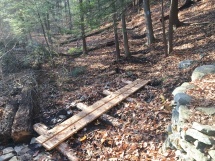 Laying new boardwalk on mountain bike trail. 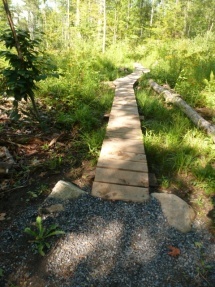 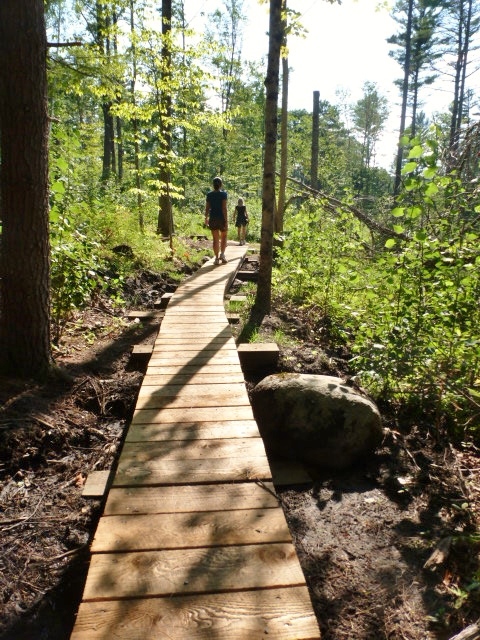 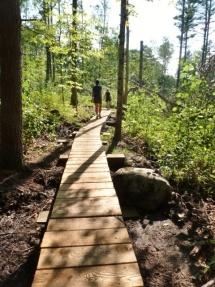 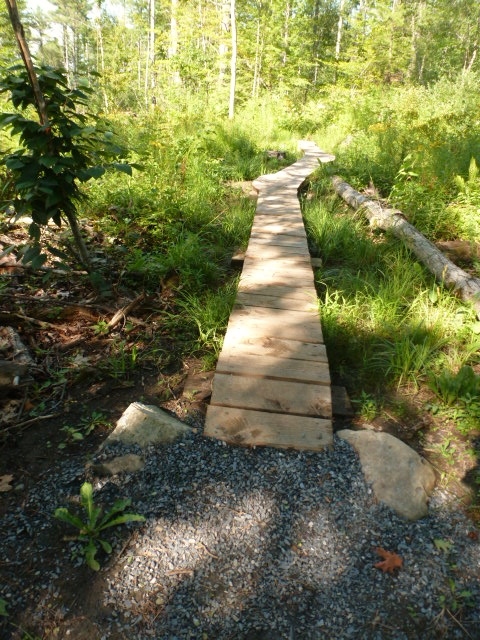 This boardwalk was built to span wet areas on a mountain bike trail also used by hikers. 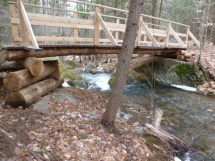 This bridge replaces an old rotten structure on an exciting mountain bike trail used. 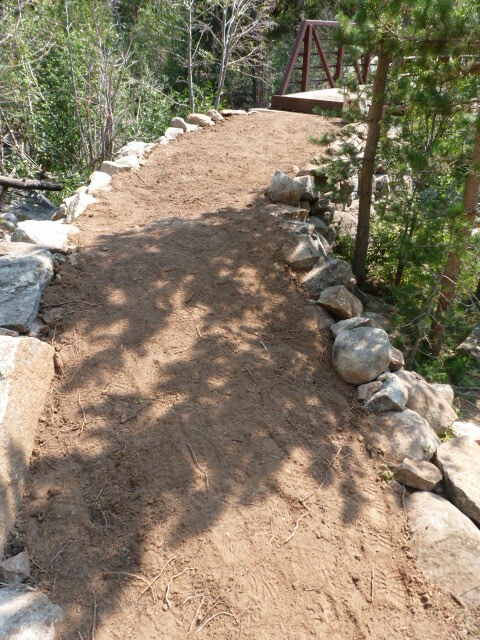 Note the pavers on the steep slope ahead used to prevent erosion. 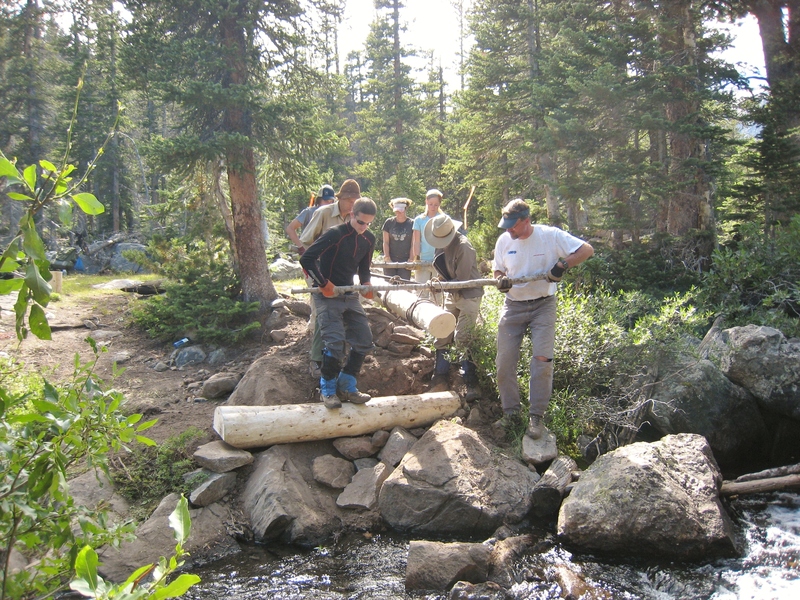 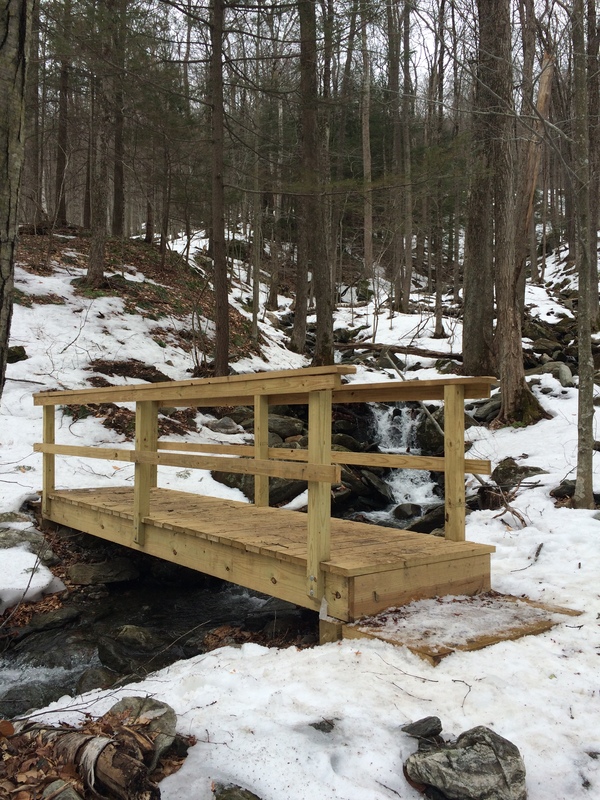 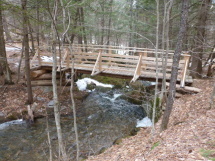 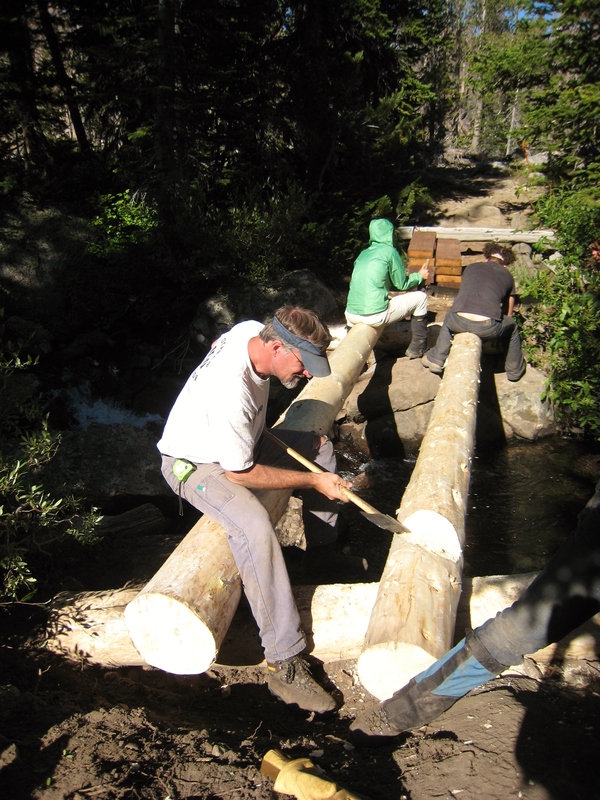 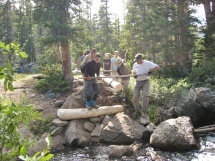 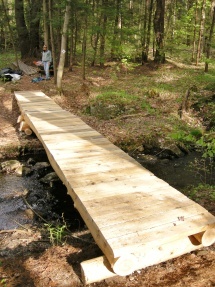 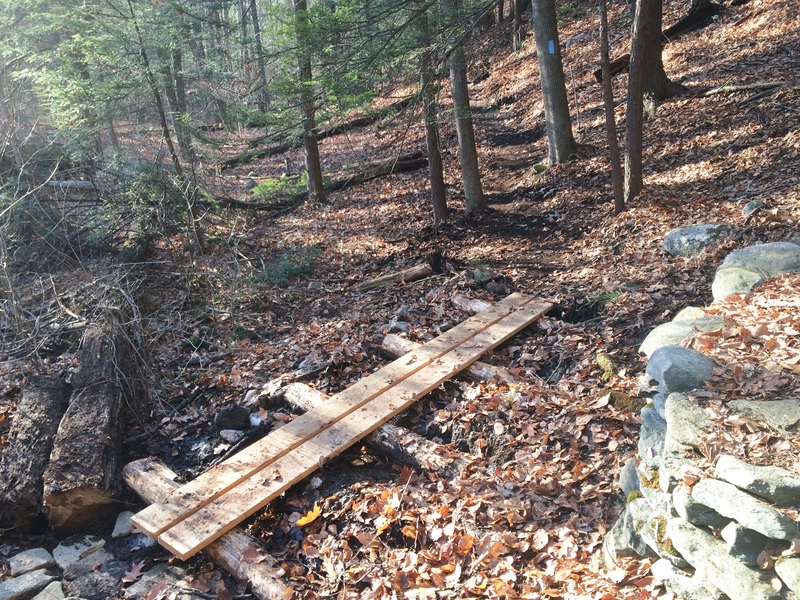 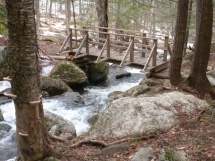 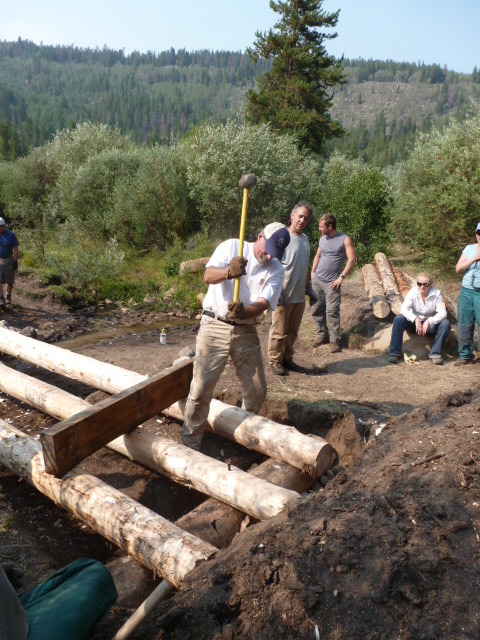 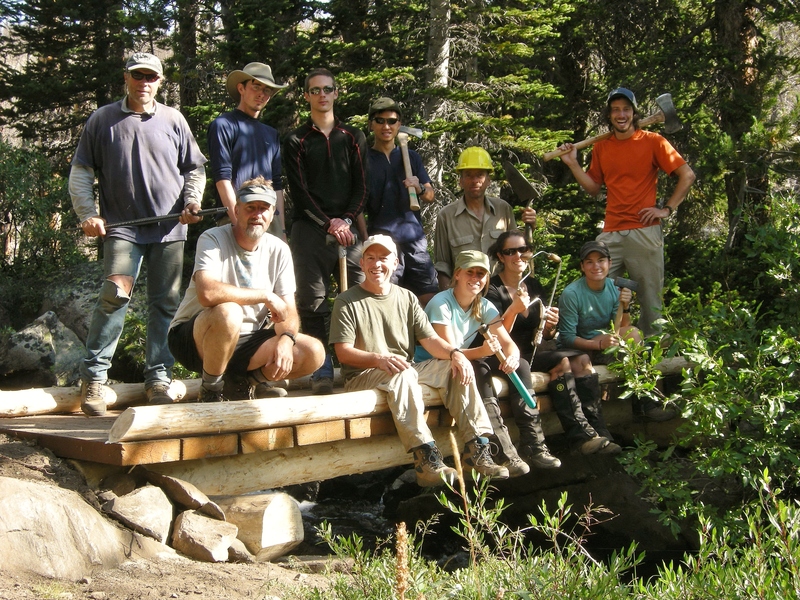 This twelve foot bridge for a seasonal stream crossing was built during a skills workshop. A second was built for the next crossing. Small foot bridge using pressure treated dimensional lumber. 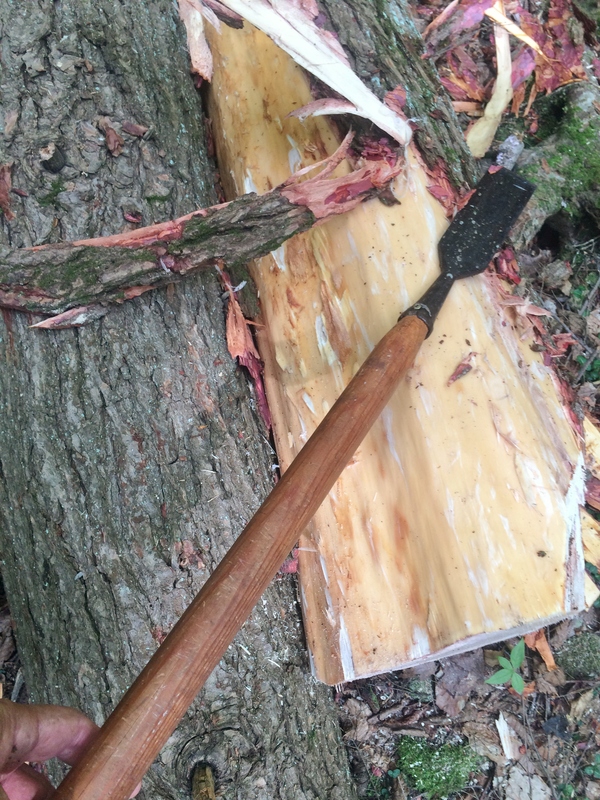 Peeling logs with a homemade slick from a chisel used by my great-grandfather. 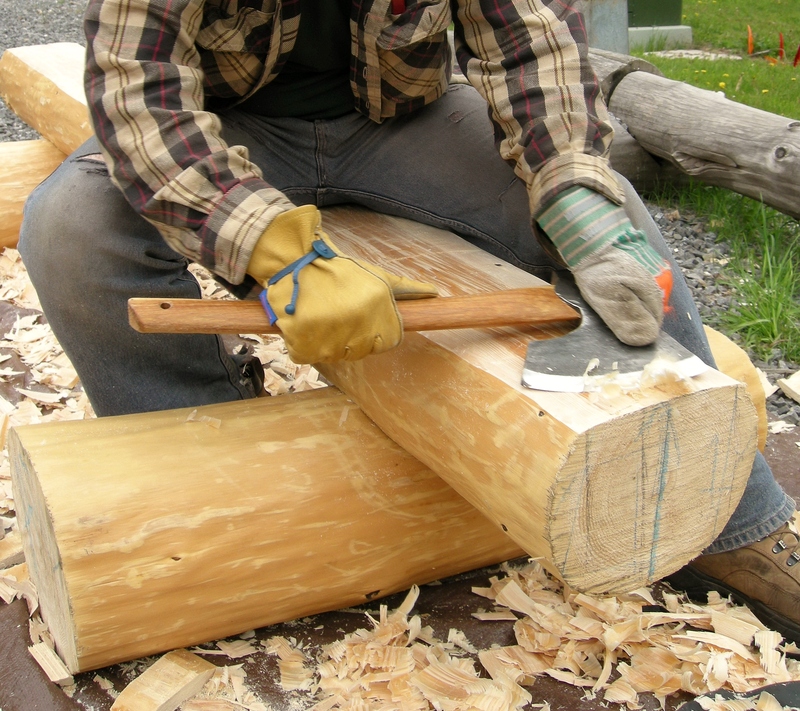 Peeling logs with a homemade slick from a chisel used by Lew&#039;s great-grandfather. Peeling and prepping hemlock logs for bridge project. 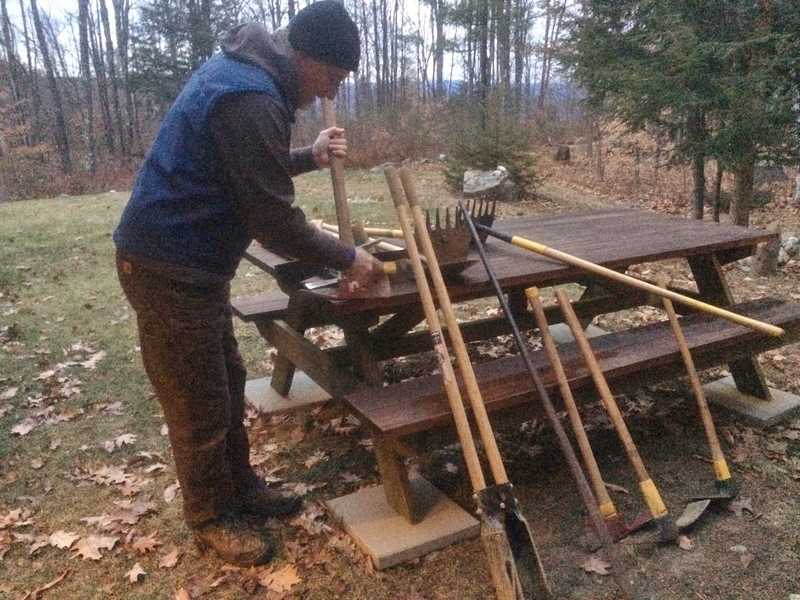 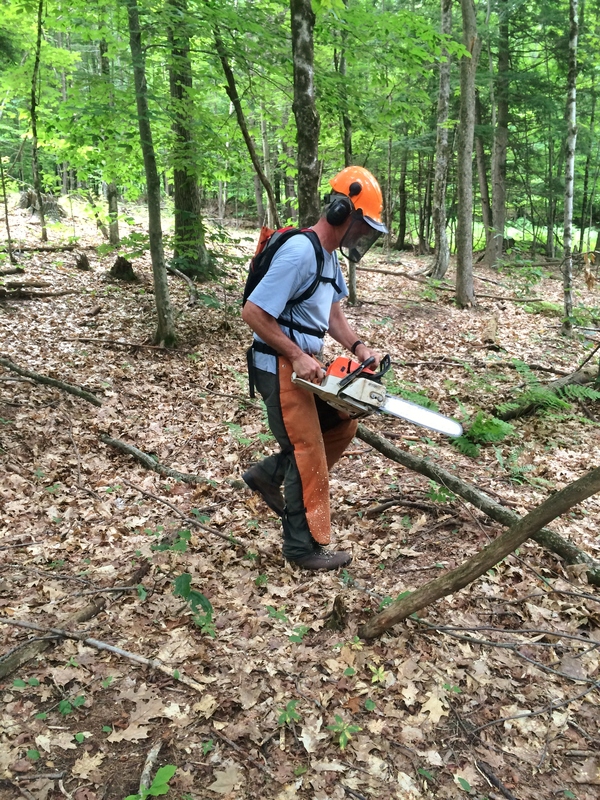 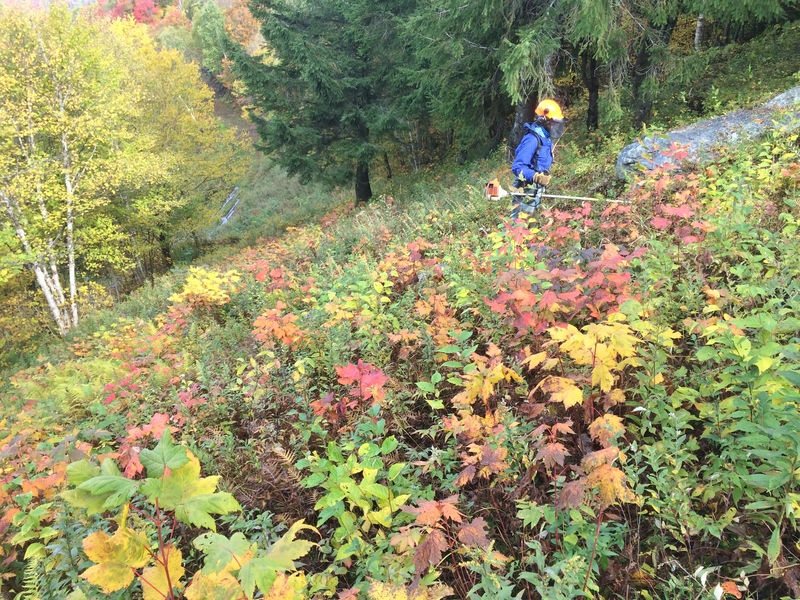 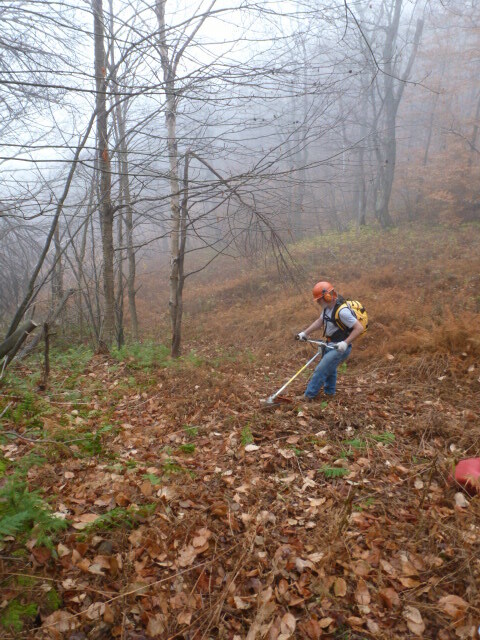 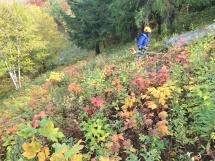 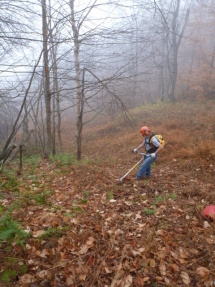 Ski trail clearing at Magic Mountain, VT.
Brushing ski trails. 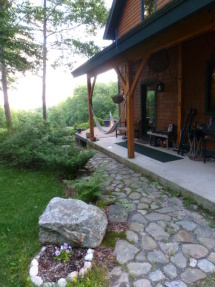 Magic Mountain, VT. 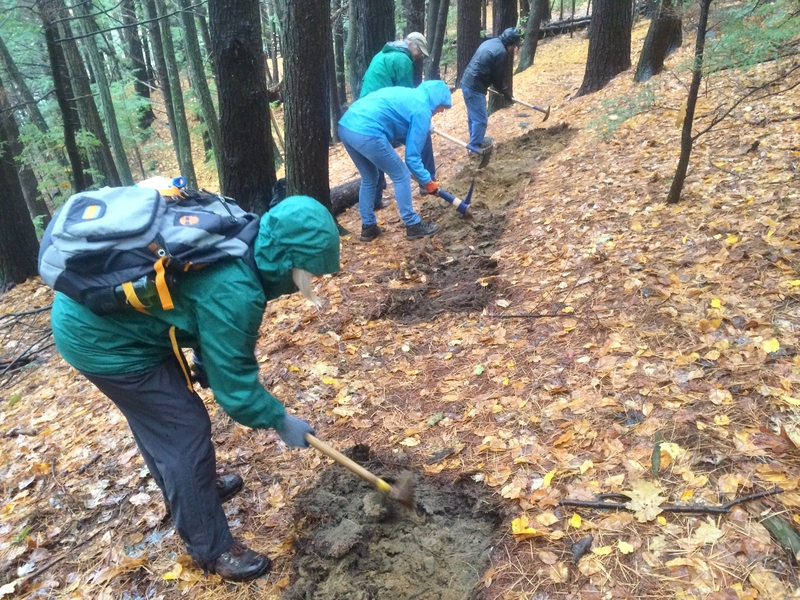 Teaching trail design workshop for Sunapee-Ragged-Kearsarge Greenway Coalition. 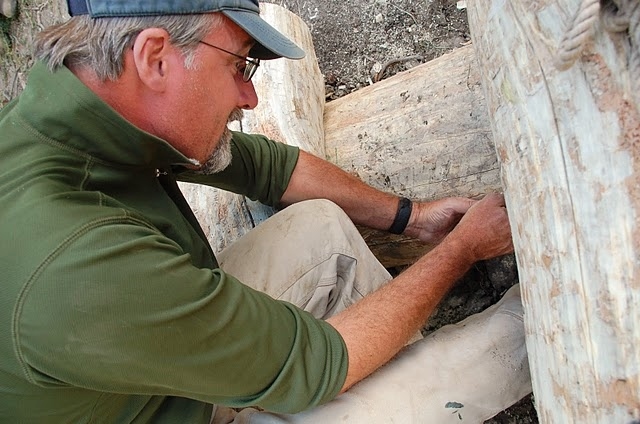 Careful scribing makes for a perfect fit when doing saddle notches on logs. 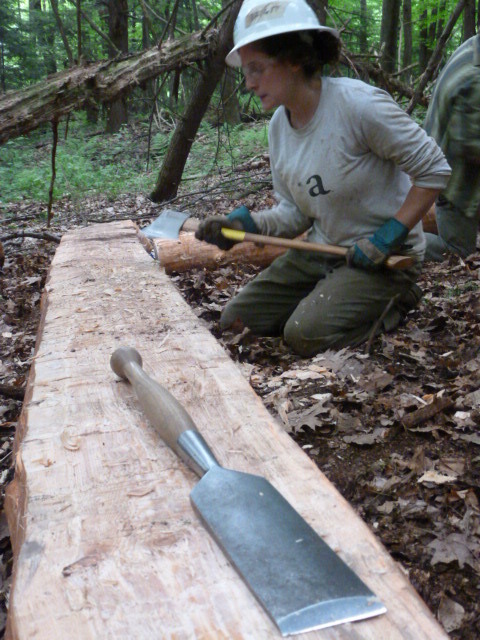 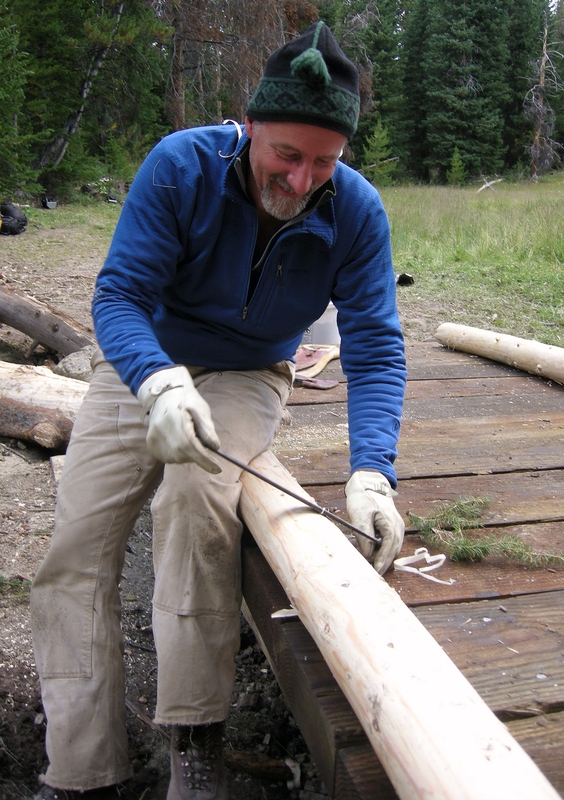 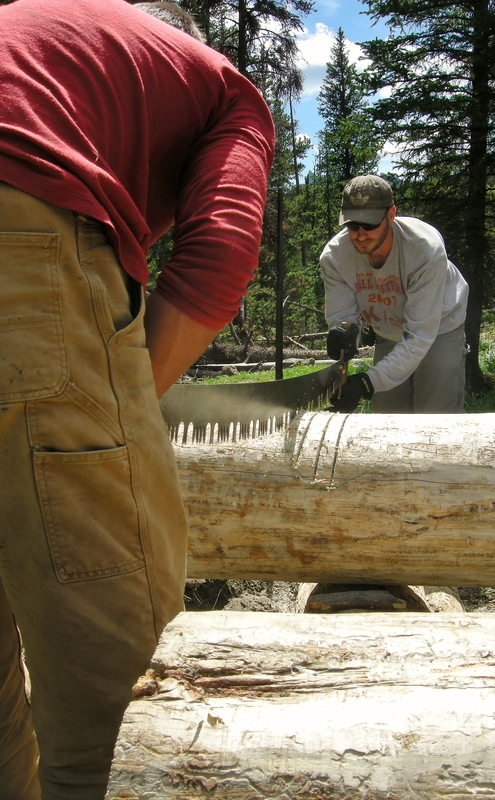 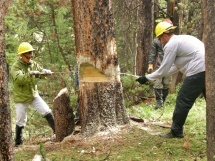 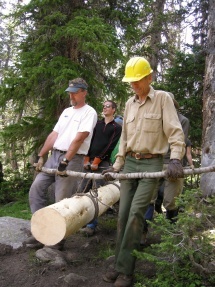 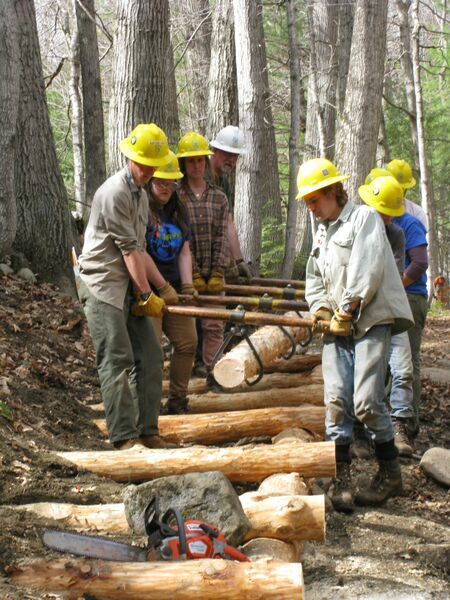 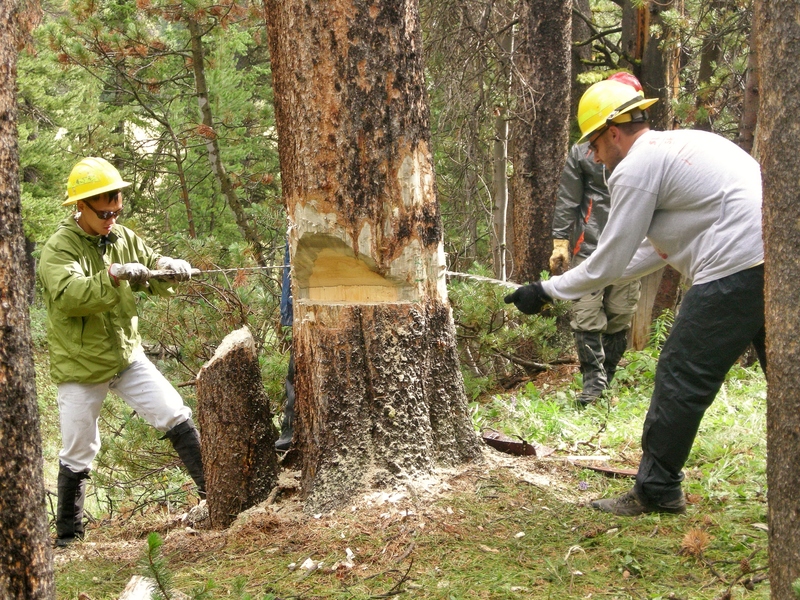 sing an ax and slick to top a log during a timber skills training for SCA. Hauling in the first stringer for a small backcountry ridge. 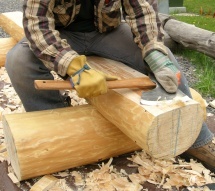 Gentle swings with an ax are used to shape notches. A sledge hammer works for pounding in rebar but only when your co-worker trusts you. 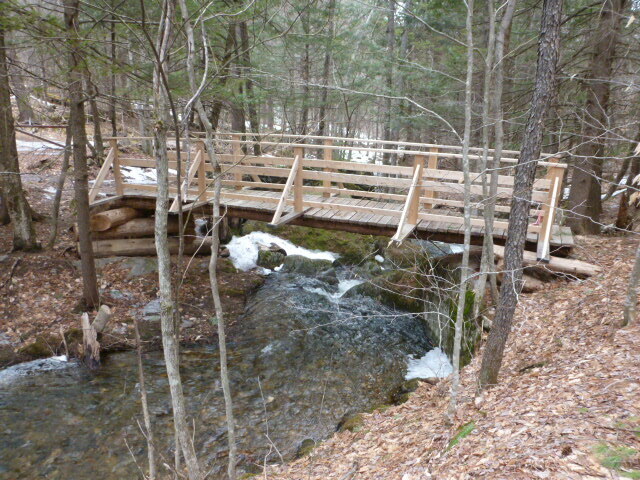 Another short puncheon bridge for hikers and horses. 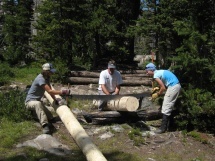 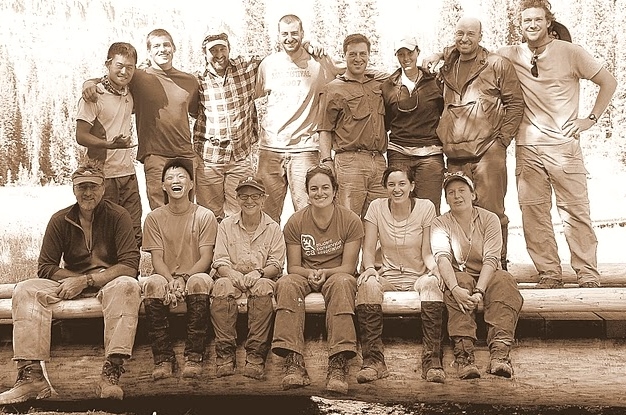 NOLS alumni Service Trip. One of many bridges in the Wind River Range, WY. Sills and prep work for a puncheon bridge for horse packers. This gas drill allowed us to prep the stringers for the rebar that secures them to the sills below. 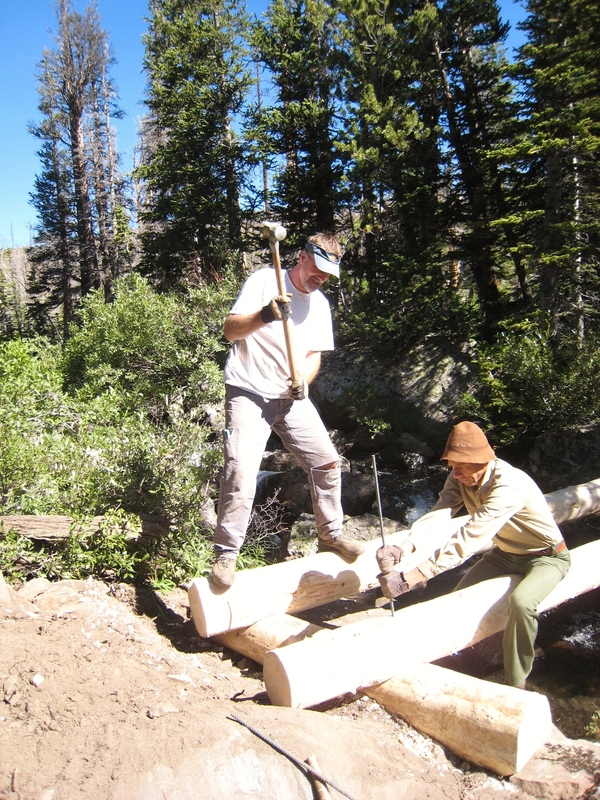 Setting stringers for a backcountry puncheon bridge. 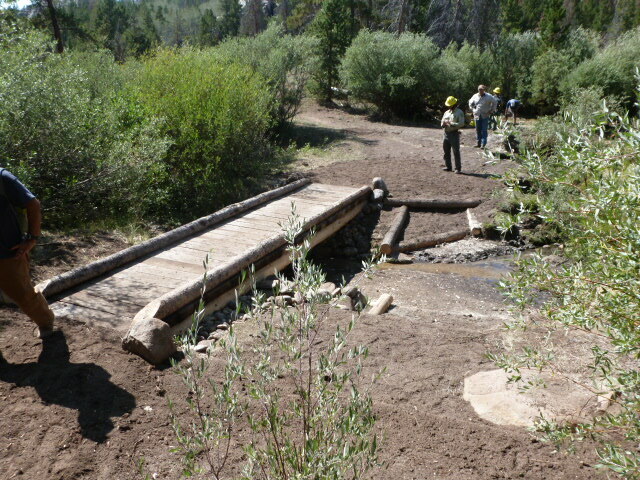 This puncheon bridge replaced an older one on a trail used by horse packers. 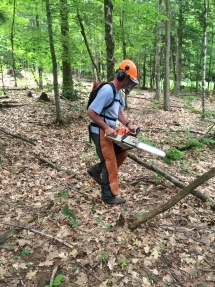 Crosscut saw for notching bridge stringers. 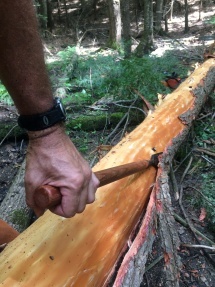 Planing timbers with an axe. An ax makes quick work when topping logs. 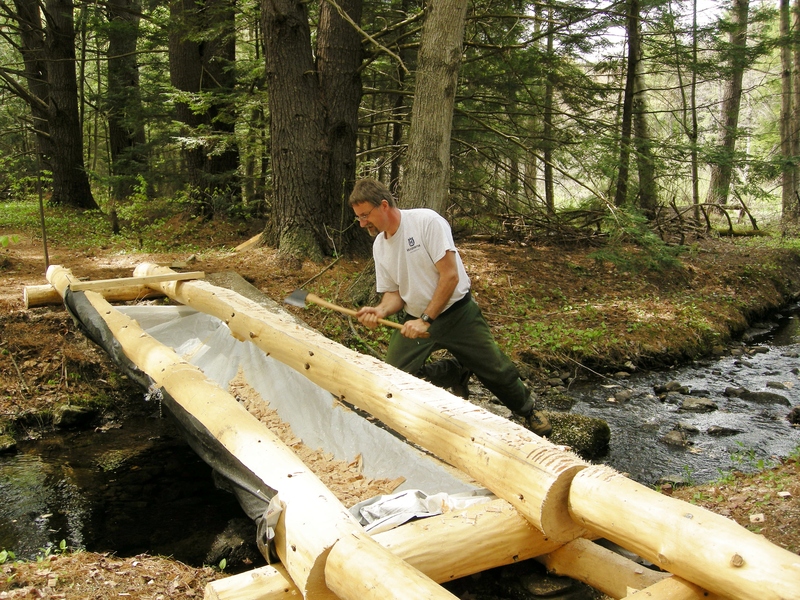 Chips are caught in the tarp for easy disposal. 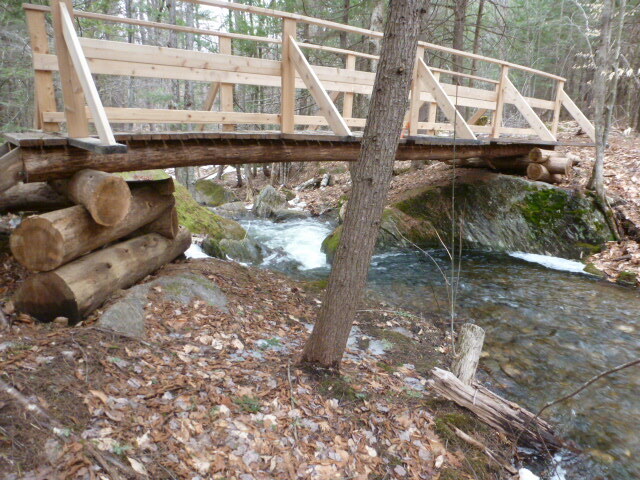 Small hemlock backcountry style bridge. Hemlock timber steps (to be backfilled with gravel). 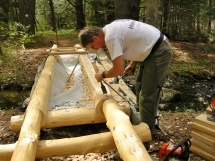 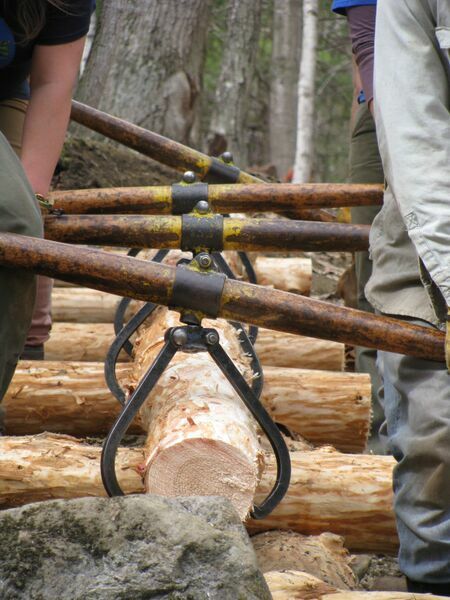 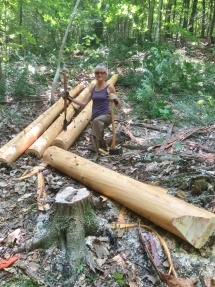 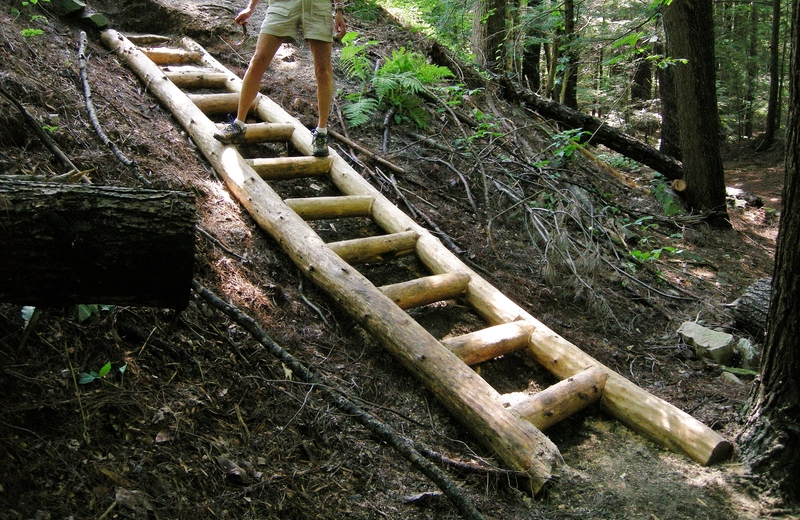 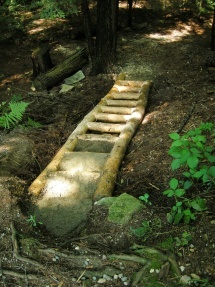 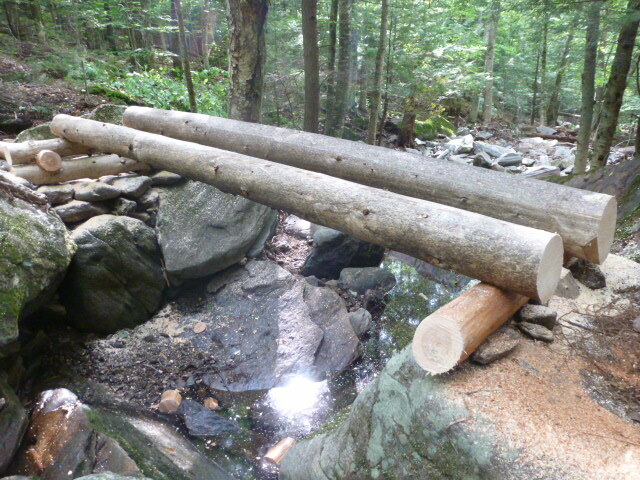 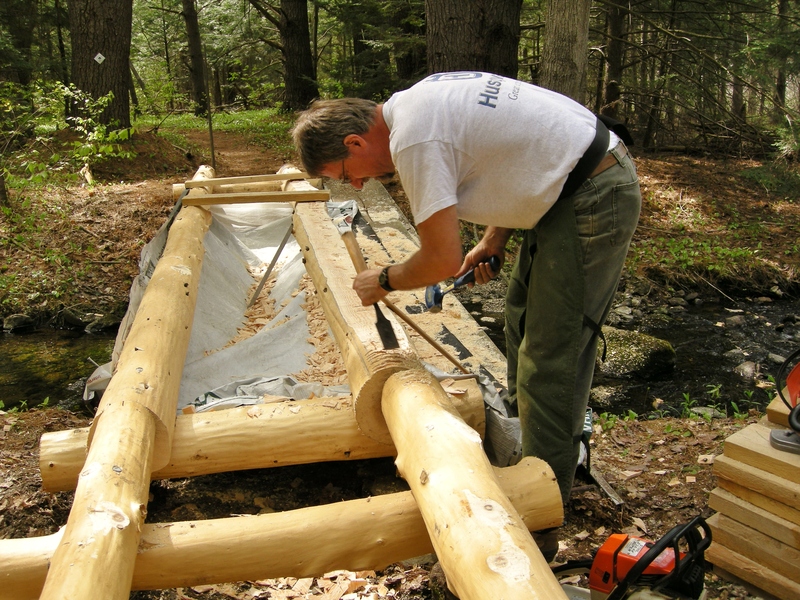 Native hemlock bridge sills and stringers being constructed for hiking trail. 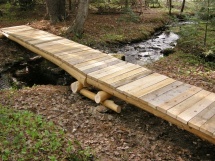 Short bridge using hemlock logs. 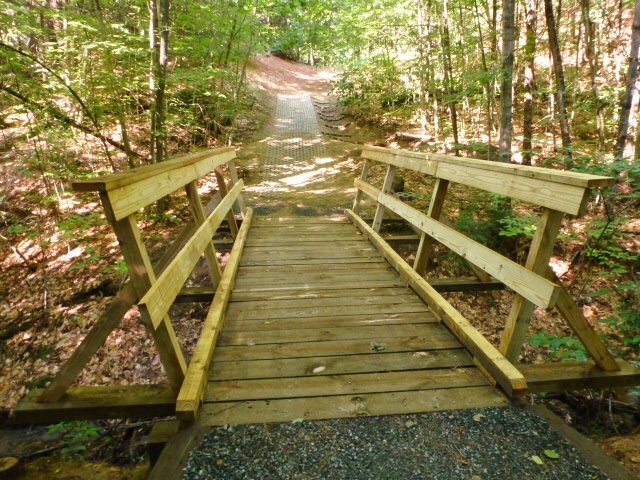 Decking and railing finished by another organization. Longer bridge using hemlock and spruce logs with piers to divert water flow. 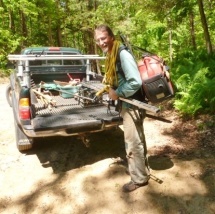 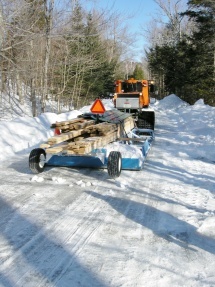 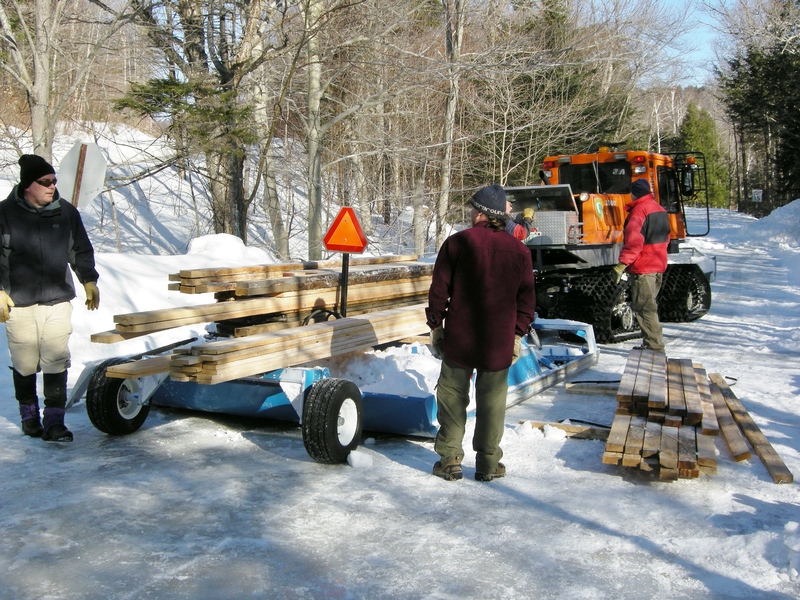 Using the NH State groomer to carry lumber to a shelter site. A full load of lumber gets carried miles in to be closer to a future shelter site. 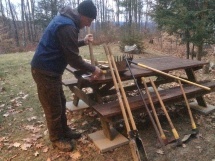 Getting tools ready to be put away for the winter. 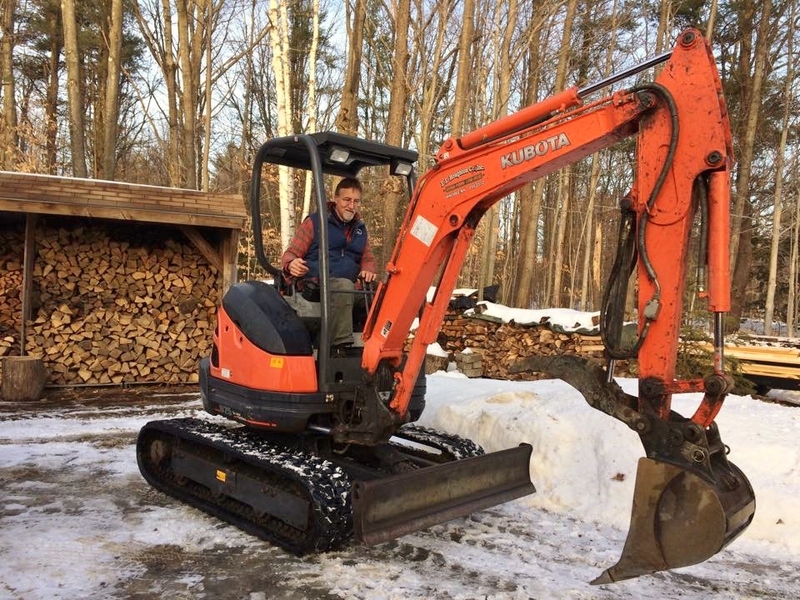 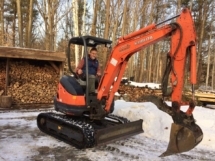 With the acquisition of this mini-excavator, SnowHawk will be able to expand our trail services. 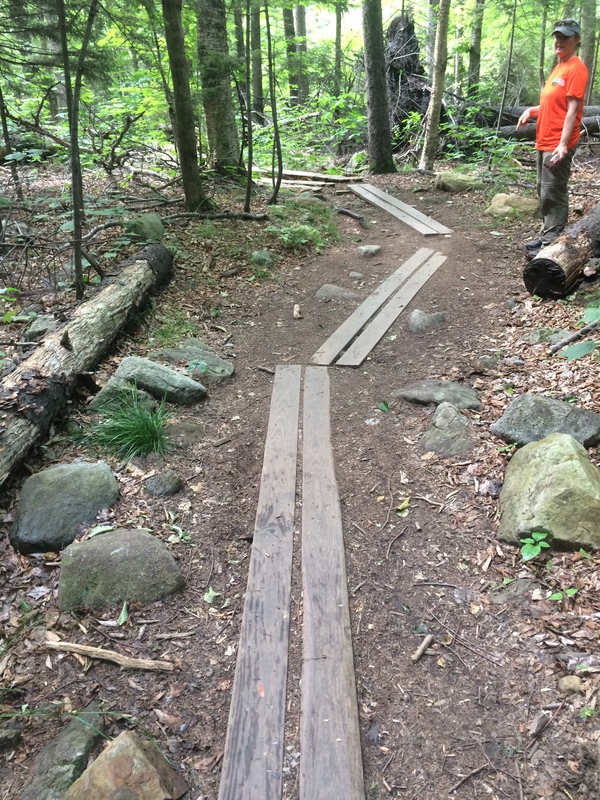 This field stone walkway works in this setting but would also be suitable for hardening a small wet area on trails. Cairns can be used for landscaping as well as marking trails.